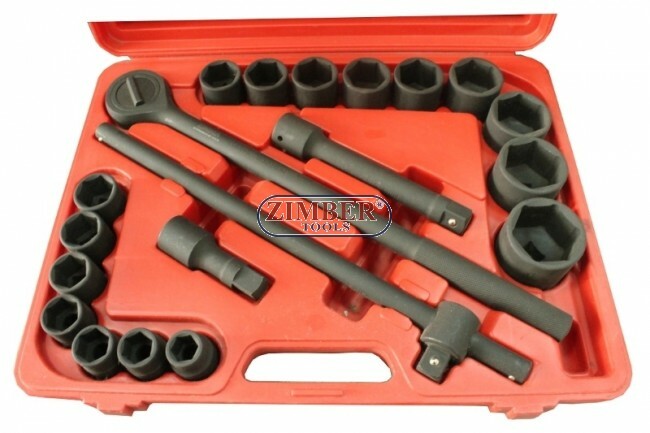 21pcs 3/4"dr.impact socket Inc (6pt) ZR-06ISS3421V - ZIMBER TOOLS..
16pcs 3/4"dr.impact socket (6pt): 3/4",7/8",15/16",1",1-1/16",1-1/8",1-3/16",1-1/4",1-5/16",1-3/8",1-7/16",1-12",1-5/8",1-3/4",1-7/8",2". 2pcs 3/4"dr.extension bar 4" & 8". 16pcs 3/4"dr.impact socket (6pt): 3/4", 7/8", 15/16", 1", 1-1/16", 1-1/8", 1-3/16", 1-1/4", 1-5/16", 1-3/8", 1-7/16", 1-12", 1-5/8", 1-3/4", 1-7/8", 2".